34" x 34" x 20"
I was searching for quality bean bags and came across the Fugu brand. This is an outstanding bean bag. It takes into account the child and parent. It’s a more price than other bean bags, bit worth every penny. My kids drag the bean bag everywhere in the house. I must admit I use myself sometimes. • The microfiber is removable and machine washable. It also allows you the option of 17 interchangeable covers. The inner liner is polyester for added protection. • Urethane foam is specially made for bean bags. You not going to find a better material for durability and comfort. It’s the best foam available. • Not too much out there about the bean bag. In terms of reviews, it’s hard to find. Strange why such a great product should not be so unknown. • Price leaves much to be desired. We getting into the high-end bean bags. It’s a specular bag, but there still higher quality bags for the same price. One of the best product I’ve found online. I don’t understand why there more info in it. Either way, it’s a great bean bag. Fugu has really covered every corner they could think off. The bad is good in and out. If you’re looking for a one time buy this could be it. 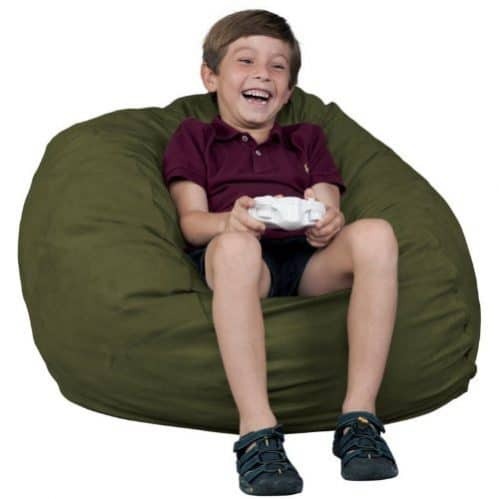 The Fugu kids bean bag chair will withstand anything you kid can throw at it. My bean bag is still taking a beating from mu kid. Impressed with the product just not so much with the price.